A breathtaking setting to celebrate that special family occasion. And a view to wow the whole tribe. Amazing contemporary barn with wonderfully spacious rooms and lovely views over traditional hop gardens and farmland, this fabulous building will make a breathtaking place to celebrate that special family occasion. With light and airy accommodation on two floors, double height ceilings, designer lighting and fabulous first floor decking overlooking the wonderful views , it really is a special place to stay. There is a private outdoor heated swimming pool, a tennis court and lots of space for all, with open plan living offering the ideal space for all the family. In addition there is a games room with table football and playstation to entertain all ages. Watch Finchcocks Oast - The Barn on Channel 4, The Restoration Man. 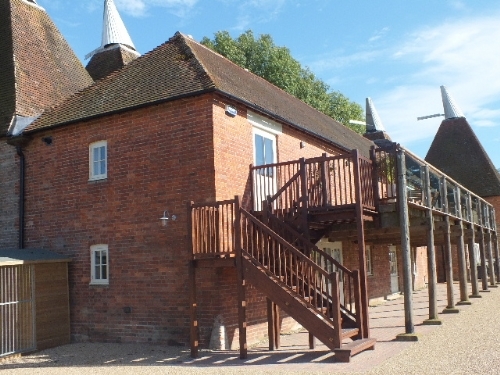 George Clarke follows the owners on this epic journey of restoring this beautiful oast house. Service rating : It was an excellent experience, we were a large group of 30 ages from 4 to 70 years. it was a family break and from 4 years to my mum 70 they all had a great time. Place was immaculate and there were lot to do for everyone. Caretaker was very helpful and friendly too. I will highly recommend this holiday house because of its facilities , location and services. Service rating : We had no problems at all with organising a long weekend in the country - Mulberry Cottages gave us all the help we needed. Product : Finchcocks Oast is a wonderful house with everything you need for a break in the countryside. The rooms were large with en-suite and beds you struggled to get out of while there was table tennis, fussball, a pool and a tennis court to keep you entertained. The kitchen and living area were spacious and attractively decorated and made for a great stay. The entertainment value of Finchcocks Oast is of the highest quality and the countryside is quite idyllic. We are so pleased you agree and enjoyed your stay. "It was a lovely weekend which everyone thoroughly enjoyed. House as last time was stunning- thank you." "We had a fantastic weekend. The Oast house is stunning. We had seen the George Clarke programme so it was great to see the real thing. We had a surprise party for my husband who is still overwhelmed by the whole thing." "I just wanted to say an extra thank you as the house was absolutely incredible. The photos on the website don't do it justice, it was Hotel quality but in a more personal and characteristic setting. We couldn't have wished for better weather and we all left promising to visit again one day. (And wishing we had stayed the week). I will certainly be recommending Finchcocks Oast far and wide"
"We have had a wonderful weekend thank you, the house is lovely, very well equipped and perfect for our family groups. We may well return sometime in the future." "Thank you, we have had a lovely week, celebrating a belated Christmas and New Year with friends. We have an annual break each year as a group of friends and it's difficult to find places to meet all our needs. There’s a strong possibility that we may return next year." "A great place to stay! We were a group of four families together for the Jubilee weekend and were the first guests to stay in this beautiful spacious property and it was amazing. It has been done out to a very high standard. The beds are so comfortable with lovely bedding, relaxing furniture in the living areas and a very well equipped kitchen. The entertainment facilities are great - the pool, the table tennis table (great for wet weather), sky TV, tennis court - all helped to entertain the children while the adults relaxed on the lovely decking. An abundance of leaflets on what to do in the area was greatly appreciated. We all concluded that this was the best place we have ever stayed in over the many years of holidaying together. It's not easy to find a place big enough for four families." This area of Kent is renowned for its vineyards, some will show you round. The beautiful spa town of Tunbridge Wells is just half an hour away, recommend the jazz nights in the Pantiles in the summer. Finchcocks Oast 23-32: 7 bedrooms on the ground floor, 5 double and 2 twin bedrooms, with the remaining two double bedrooms located on the first floor. For additional sleeping, each bedroom also has either a sofa (double) bed or a (double) day bed. Each bedroom has its own ensuite bathroom or shower room. Please consider how you wish the beds to be made-up to agree the make-up and number in your group. Also, a Bang & Olufsen (B&O) TV with Sky+HD viewing area. Each bedroom is large. All bedrooms are en-suite with each providing a walk-in shower. In addition, each of the 3 largest double bedroom en-suites also come with a bath. PlayStation 3, table-football, plus a further 2 sofa-beds. Kitchen is equipped with a gas range and ovens, separate electric ovens ( 4 ovens in total), domestic dishwasher, fridge and drinks cooler-cabinet. Large utility room houses a commercial dishwasher, washing machine, tumble dryer, microwave and a second large fridge with freezer compartments. Parking for all on the gravel drive, also on grass area. There is also a large grassed games area with tennis, table tennis and badminton equipment provided. The heated swimming pool with pool house, and tennis court are for the exclusive use of The Oast, and are both separate and fully fenced areas. Sun-loungers, umbrellas, chairs, tables, plastic crockery and glasses, towels and games equipment are provided. Two BBQs are also available from the pool house. Please Note - Out of consideration for our neighbours and our guests' enjoyment of the peaceful and quiet countryside location, music is not permitted to be played in or outside the property after 11pm. Visitors Day and Evening - The house is strictly available for those booked and named. Over occupancy is strictly prohibited unless agreed in writing with the Owner prior to arrival. Heated swimming pool available for use May - September, tennis courts. Guests are requested to keep noise to a minimum between the hours of 11pm and 9am. All amplified music is forbidden. We regret this property is not suitable for erecting a marquee. The maximum seated dining at anyone time is 42.